Bernie Sanders - The Best of a Bad Bunch? We put the question to a local bulldozer operator whom we’ve known for at least half a century. Tommy, now 80 years old, is the last of a dying breed. He grew up plowing the earth to grow tobacco on Maryland’s Tidewater, on the western shore of the Chesapeake Bay. In the 1970s, when tobacco farming became unprofitable, he switched from plowing the earth to moving it around. He is still at it. And as near as we can tell, he will go on with it until his eyes give out… or his mind fails… and he knocks over a suburban house by accident. In the meantime, he pushes dirt in the same spirit we write these Diary entries – with the happy nonchalance of a hen laying an egg. It was Memorial Day weekend. Hot and humid already. We had asked him to come over to see about taking out some trees. In Maryland, trees grow fast. If you leave them on either side of a field, pretty soon you don’t have any pasture left… just a shady spot between the tall trees. Tommy’s family has been in this area for about 300 years. Like the few old-timers left in the area, he speaks with a distinctive accent – more like the Deep South than the Baltimore metropolitan area. So far, 65% are with “The Donald.” Only 1.8% are abstaining. Our guess is the list of Trump’s supporters will grow. Elections, like lotteries, bring in the crowds. People know that you gotta play to win. A Trump donor has about 50-50 odds that his investment will pay off. An abstainer will get nothing. So, the cronies… the zombies… the Deep State operatives… contractors… suppliers – all are hitching themselves to the bright star of reality TV’s Donald Trump… or the twinkling of the coy Planet Clinton. Roger Stone, Corey Lewandowski, Steven Mnuchin, Paul Manafort, and Laurance Gay – the Trump team overflows with hacks, lobbyists, and insider dealers already. They are busy making promises to line up even more support: a new highway for one district… a new prison for another… more drones… more benefits for federal retirees… more drugs… more this… more that. All of it at someone else’s expense, of course. Ms. Clinton has even more promisers on her team. Mr. Trump says his campaign team numbers only about 75 people. Ms. Clinton will have 800 grasping parasites to look out for if she wins the White House. At the Diary, we favor lost causes, die-hards, and underdogs. Neither Clinton nor Trump fill the bill. But Sanders? 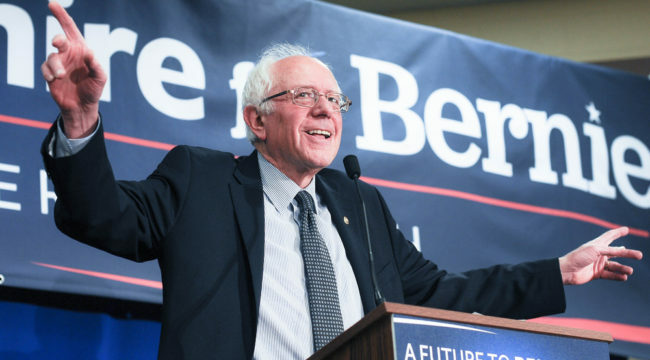 “Bernie Sanders is prolly the best uva bad lot. His ideas are turrble, but he seems like a decent fella. And since nobody ever thought he’d git this fahr, I reckon he didn’t haf to make no promises along the way. Tommy may be the only voter to see Sanders’ shorter life expectancy as a campaign plus. But he’s not the only one to see that it doesn’t matter what Sanders’ thinks or wants. The system changed in 1971, when President Nixon took the dollar off the gold standard. Since then, the powers that be no longer depended on Congress… or savers… or voters… to raise the funds they needed. The feds could run huge deficits – no matter who was in office. Wall Street could earn huge fees, too, from lending out money that no one ever saved. “I remember in the ’70s,” said Tommy, as the conversation turned to money. Why don’t the banks want our money? They no longer need it. When banks make a loan, they create new deposit balances on the spot, using nothing more than a few keystrokes on a computer. There’s no need for pre-existing savings. But real resources – time and money – are limited. Pretending otherwise, by lending empty credit as though it were real savings, misled investors and consumers. The “seed corn” that should have increased productivity and higher wages was squandered. Instead, we have financially modified pseudo credit-corn; it looks just like the real thing, but it produces no crop. “Misallocation of resources,” we said to Tommy, explaining why we are no richer today than we were 40 years ago… and how “free” money poisons an economy.